I work in a therapy service where I am developing new relaxation audio tracks amongst other useful activities. When I can I love to draw and I am often working on a commission, collaboration or personal project. As well as drawing and painting I do my own curating/promoting, distribute books and records and write/illustrate/publish fanzines. I am old enough to know a few things. I could know with knowing a bit more. I drink my coffee black no sugar. I like rock and roll sung in French and Japanese. I make a reasonable pizza from scratch. I have recently been reading about, watching a BBC drama and listening to podcasts about Hollywood stars of the 1900’s inspiring a series of pen and ink drawings. 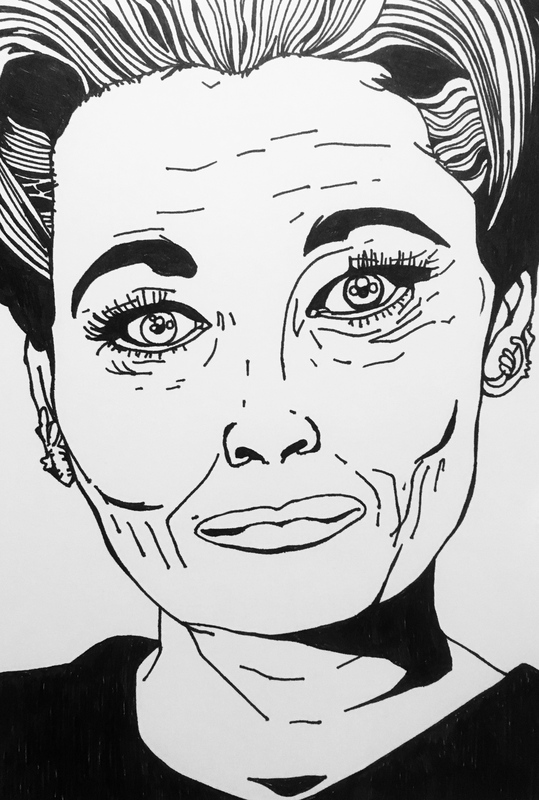 Featured above is a drawing of Joan Crawford. Prior to this I did a collection of watercolour paintings based on celebrated figures who died in 1997. My art work links into my interests and curiosities and is designed to be displayed ‘in conversation’ with other drawings, photographs, text, etc that the work is linked to – I am very interested in communication and this underpins pretty much all the things I do – finding common ground and some understanding.